The 13-mile Murtaugh stretch of the Snake churns up big excitement with Class III-IV rapids — big wave surfing for kayakers and a challenge for advanced to intermediate rafters and kayakers. The scenery is framed by the towering cliffs of the Snake River Canyon. Mogensen Trail is conveniently located minutes from Twin Falls and Jerome. Enjoy waterfalls, bridges, BASE jumpers, and more on this peaceful hike! Chasing waterfalls? 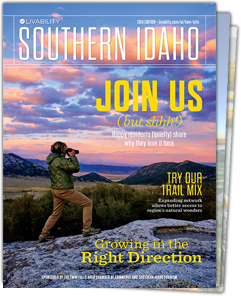 The ultimate waterfall guide of Southern Idaho will give you directions, advice, and other facts about epic waterfall adventures! The smooth rock walls of Black Magic Canyon, carved by the Big Wood River thousands of years ago, provide an Arizona slot canyon aesthetic. In the summer, the water carves through the lava rocks, hiding it as if it didn't exist. But in the fall and winter - there is epic exploring to be done! Explore Southern Idaho's 10 best Spring Break locations! Who needs the beach when you have snow covered mountains and waterfalls to see? Taste amazing beers throughout Southern Idaho. Start in Buhl, Idaho at Magic Valley, and make your way to Twin Falls for three more brew pubs! Koto, Milner's Gate, and Von Schiedt! Snowmobiling is one of winter’s great joys, and Southern Idaho calls you to blaze your own trail. She offers physical challenges for anyone willing to seek them — but saves her most daredevil opportunities for winter. Chasing waterfalls has taken on a whole new meaning in Southern Idaho. Discover frozen waterfalls this winter season!